In today’s medical practice, a practice management system and EHR are just the beginning. You need to keep up with a challenging reimbursement environment, and an even more challenging regulatory one. It’s not just about information technology or a software system; it’s about knowing how to use them. This is where ASP.MD comes in, the one vendor handling all of these challenges. We not only provide powerful, flexible, always on, always up to date, totally web based information technology for your practice. We also optimize your billing. And finally we expertly guide you through the worst of whatever regulations and reporting CMS or your ACO require next. 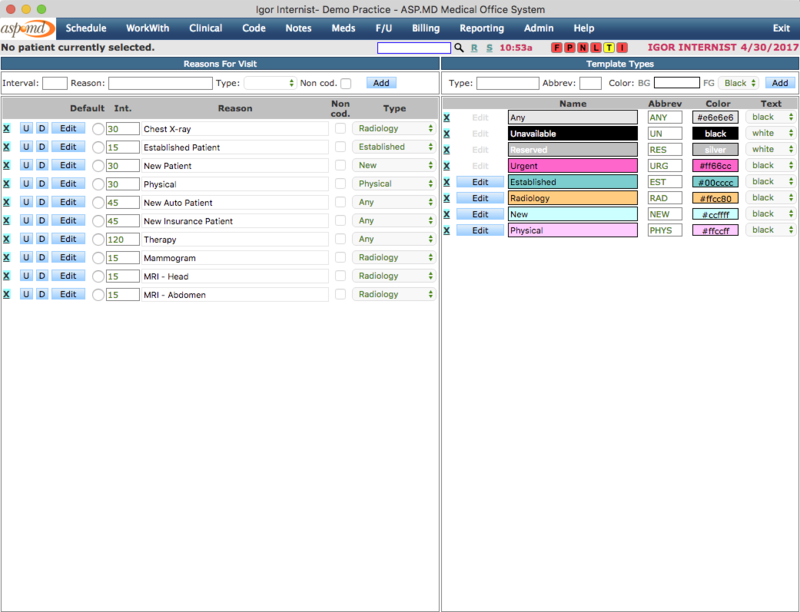 ASP.MD modernizes your IT with the latest in always up to date web based systems for practice management and EHR. We modernize your billing, to get you the best returns at the lowest cost. And, we simplify complex MACRA requirements and step you through them, making sure you get the credit for your performance that you deserve. Large healthcare organizations leverage IT, EHR, PQRS/MACRA/MIPS, and the regulatory environment to scare you into their fold, where you’ll work for them. They’ll tell you that it’s no longer possible to practice medicine independently, that the required systems are too complex and too expensive for any one practice to manage. But, these are scare tactics, aimed at making you an employee. The fact is, you don’t need to be afraid, and you can be independent. With ASP.MD, practices CAN and DO do it on their own- at a much lower cost than the large organizations, and earning up to 40% more than their employed colleagues. In the last several years, you’ve probably been forced onto an expensive to buy, expensive to maintain EHR that doesn’t even do everything you need and is already behind the curve. It may even require you to do extra, redundant work or require you to export data to another system for quality analytics. Meanwhile, you’re thinking that a software system is supposed to make your life easier, not harder. After all, isn’t that the point? Enter ASP.MD. 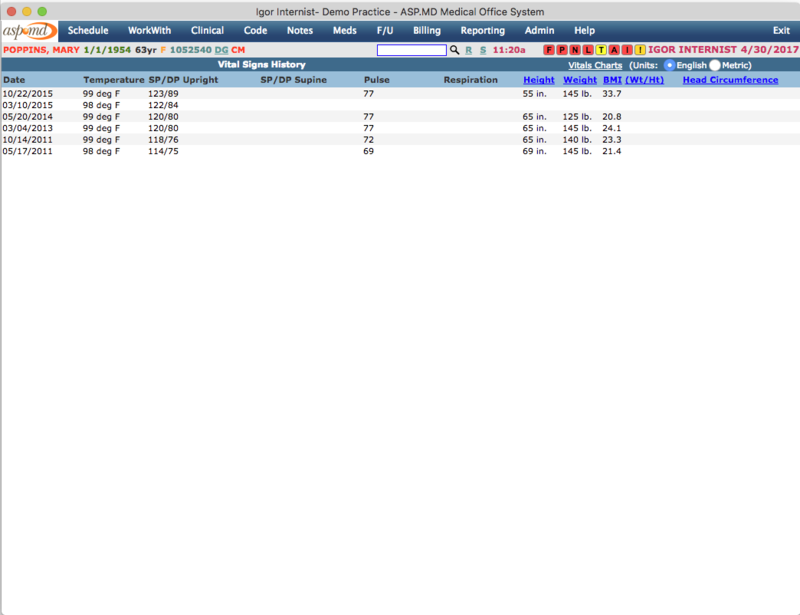 Totally integrated, fully web based practice management, EHR, and MIPS analytics without any up front costs. Always up to date without any maintenance, everything you need for MACRA and MIPS, and a whole lot more. 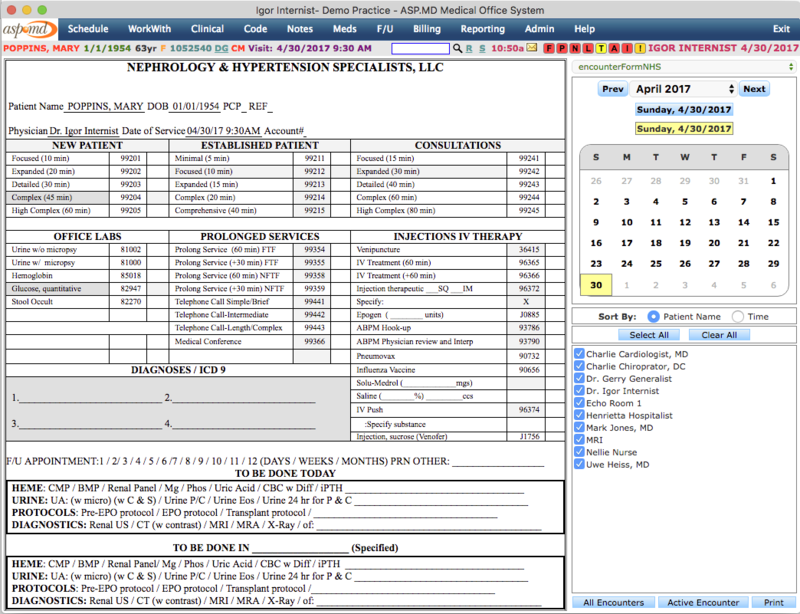 Incredibly well designed, ASP.MD minimizes the extra data entry you need to do, by combing through the data it already has on your patients to meet quality measures and eliminate your need to double document. The system is incredibly affordable. And if you use it, it will probably result in increased earnings which outweigh its costs. Perhaps it’s time to get away from a system you’ve been forced onto, and instead go with something you choose. You just might feel a whole lot better. 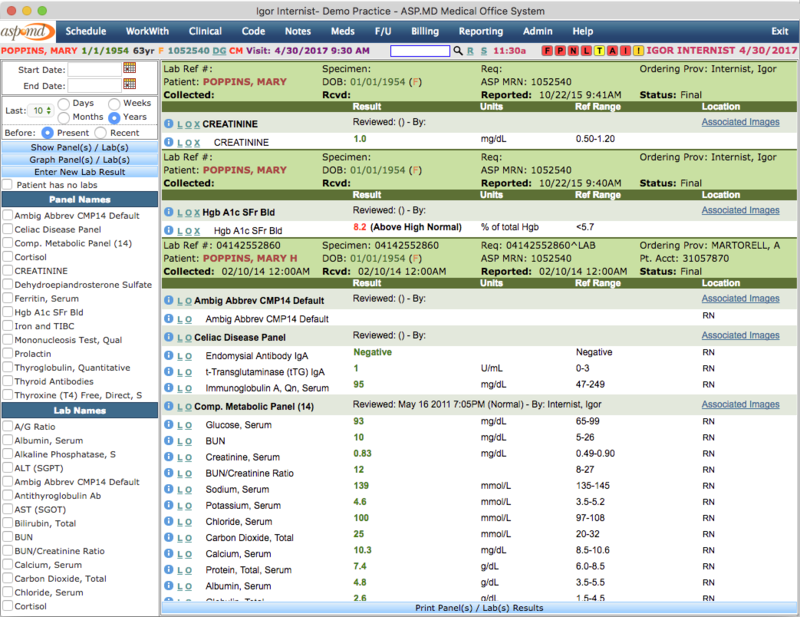 The ASP.MD Medical Office System was designed and built by a physician software engineer. He understood better than just about anyone just how busy doctors are, just how unfamiliar with computers many of them are, and, just how arcane a software system can quickly become if not properly designed. So, he built a system focused on usability, and built around several key design features. Make the system powerful, but easy to use. Limit data entry; don’t require unnecessary or redundant data entry. Integrate all parts of the system, so that it’s very easy to move from one section to another, with minimal clicks. Concentrate a lot of data on a few screens, so that a lot of navigation isn’t required. Build help and tips right in to the workflow, so that users know what’s what. Provide excellent online documentation to assist users as necessary. Assist users behind the scenes, doing things for them that they would otherwise have to do themselves. In addition to good design, the Medical Office System is also molded through years of user feedback. 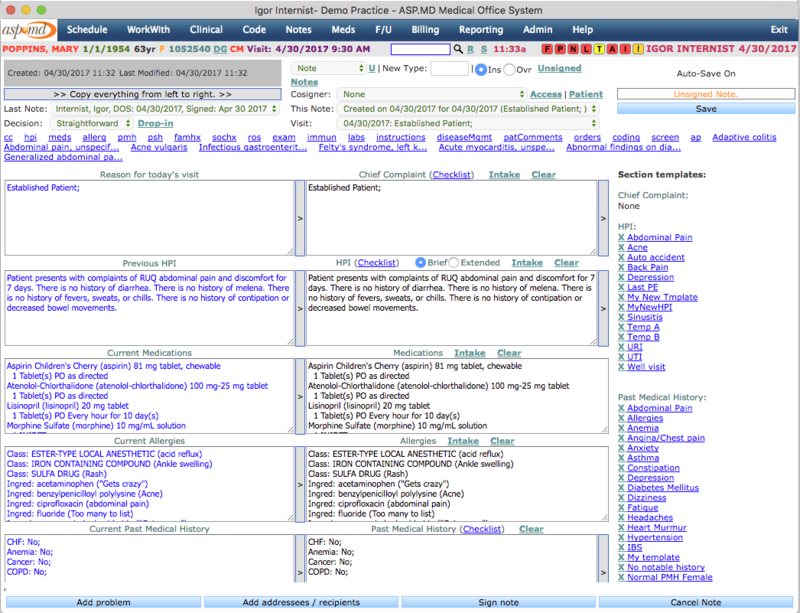 Hundreds of features have been added per user requests. And features have been fine tuned and modified until they are truly intuitive. ASP.MD takes customer feedback to heart, and it shows. The result of these principles is a very powerful system, that’s not hard to use. See the panel below for screen shots and page by page list of features. See our features page for a summary of features. 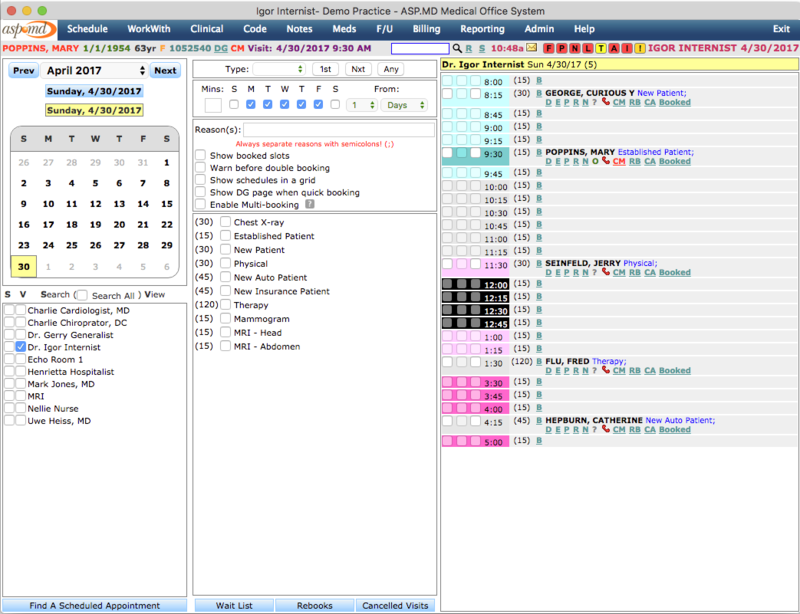 A good practice management system is as important to your practice as a good EHR. 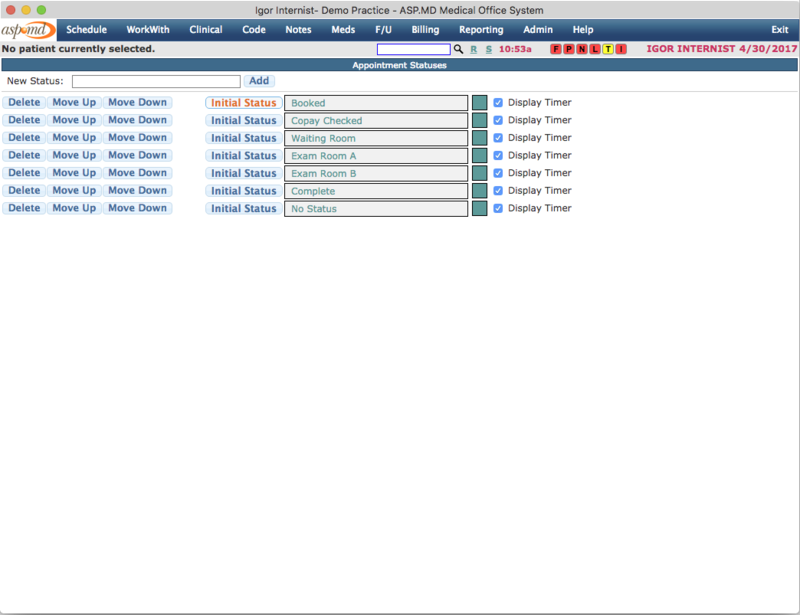 The ASP.MD medical office system features powerful scheduling and registration, with a host of added features like automatic electronic eligibility checking and an automated phone/text/email appointment reminder system. AMOS makes sure that your staff captures everything that’s necessary for billing on patient check in. Electronic coding eliminates paper encounter forms; built in coding rules reduce coding errors. HCC tips alert you to the best diagnoses to choose for maximal reimbursement. All this adds up to clean, ready to submit claims which are then automatically submitted by the system, with a first pass rate of over 98%. Following submission, claims are scrubbed and then adjudicated, and any rejected claims immediately flagged for follow up. Likewise, accepted claims are paid and electronically posted, typically within 15 days. 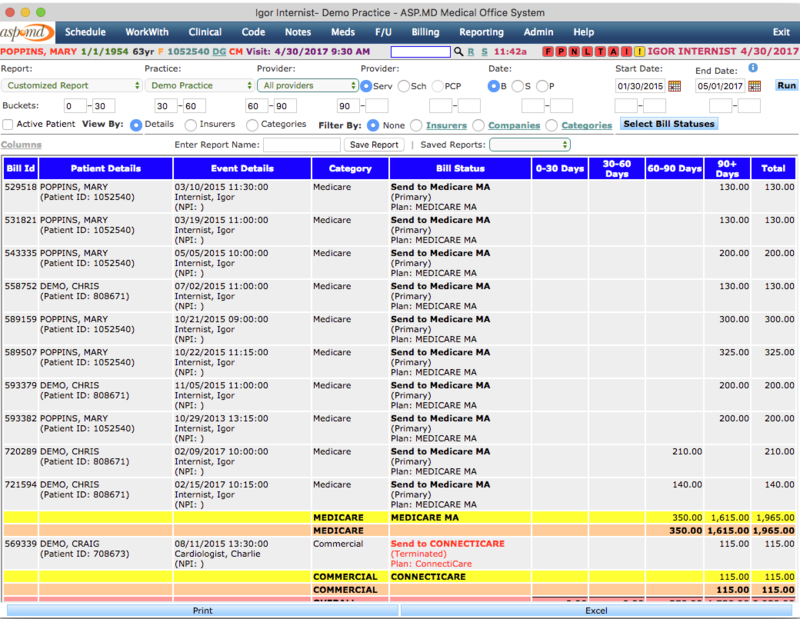 Finally and perhaps best of all, the ASP.MD Practice Management components give you complete insight in to your billing status, in real time, at any time. If you elect to have ASP.MD work your claims, you can see how we’re doing, right down to the claim level, whenever you want. 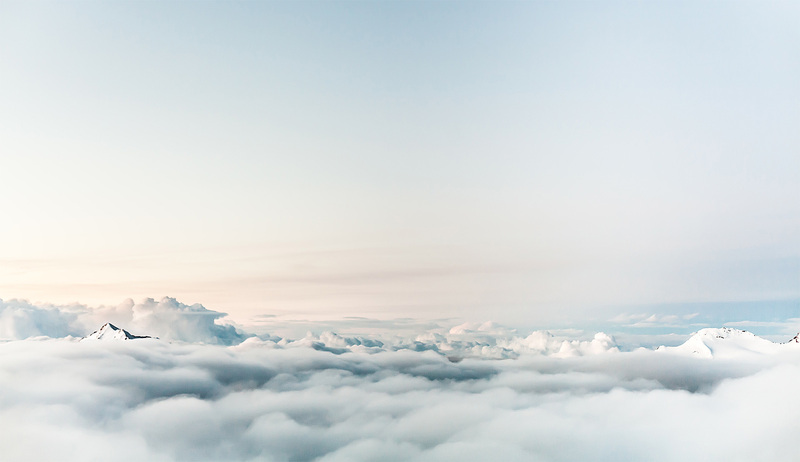 No more putting blind faith in your billing company, and finding out months after it’s too late that they’ve let tens or even hundreds of thousands go. 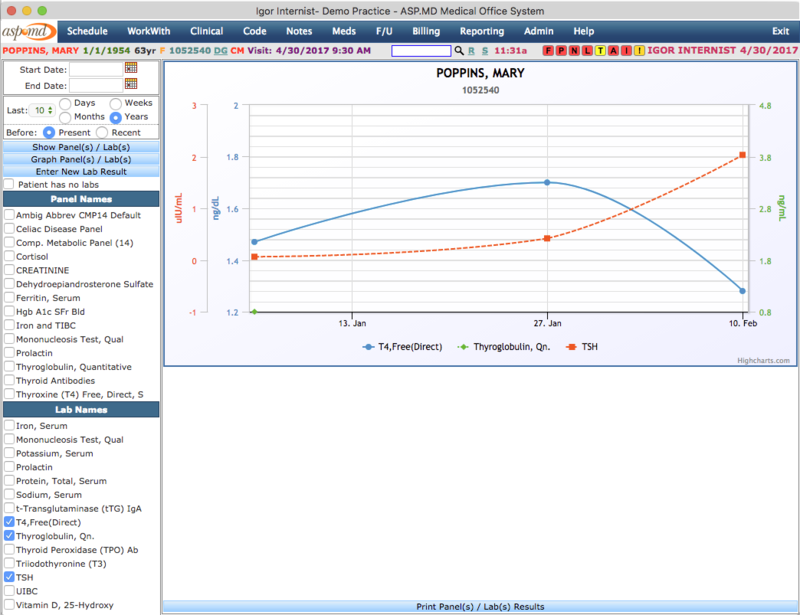 Take a look at the panels below for an up close look at ASP.MD Practice Management features. The ASP.MD Patient Portal makes communication with your patients easy. To add a patient to the portal, simply get their email address at the front desk. 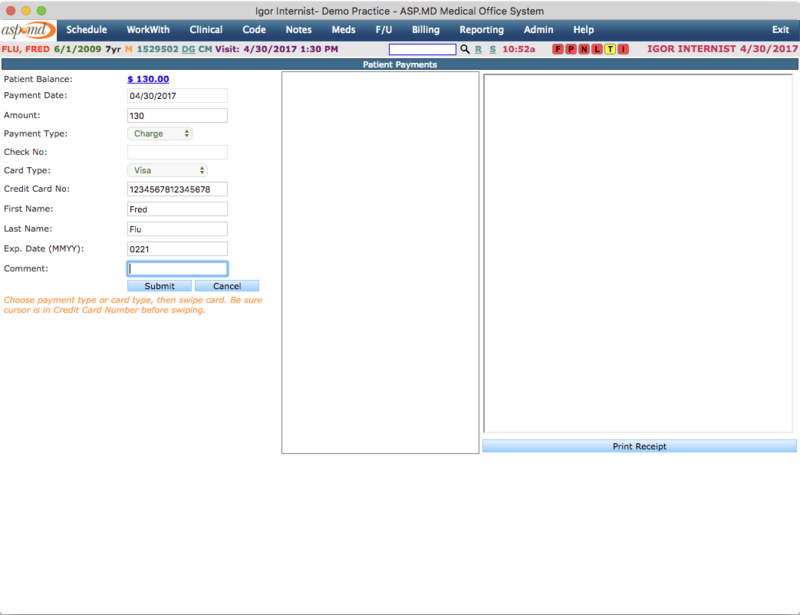 Then, click a button, and ASP.MD will email the patient a login to the portal and instructions on how to get going. From there, it’s as easy as can be; the patient logs in, and they can see all of their core information, see lab results, and message you or receive a message from you. 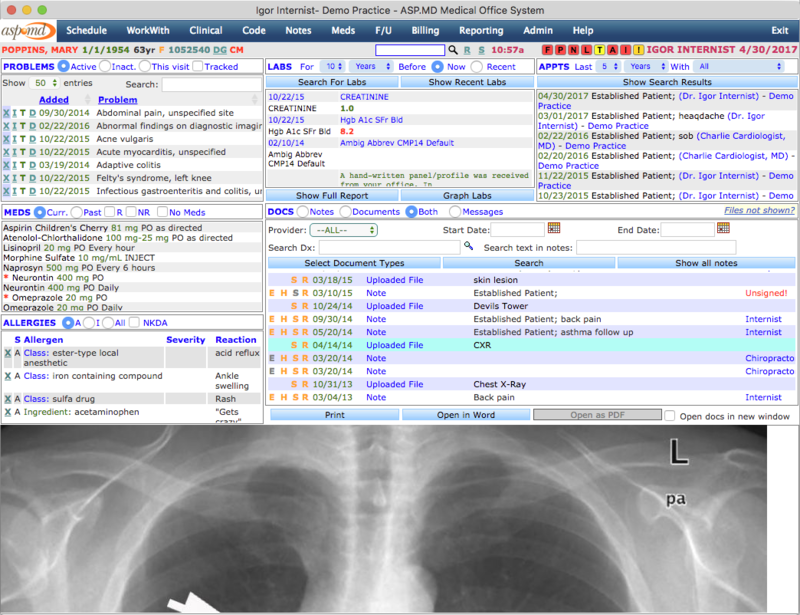 You can also, at your option, easily share notes or documents with the patient. Finally, they can download a summary of their clinical information for another provider should they need it. 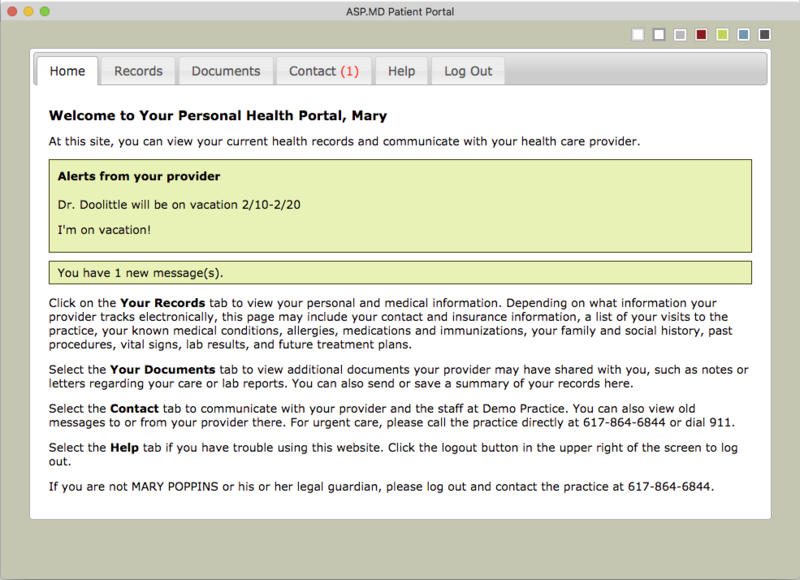 See the panel below for images of the patient portal, what it features, and how easy it is to use it. ASP.MD doesn’t just make the best web based medical billing system on the market. We also use it to provide the best medical billing services. Most billing companies don’t use or control their own software system. So, they pay a lot for their systems, and pass the costs on to you. And, when they need something updated fast, it often doesn’t happen. By making and controlling the software we use, ASP.MD can do more and charge less. 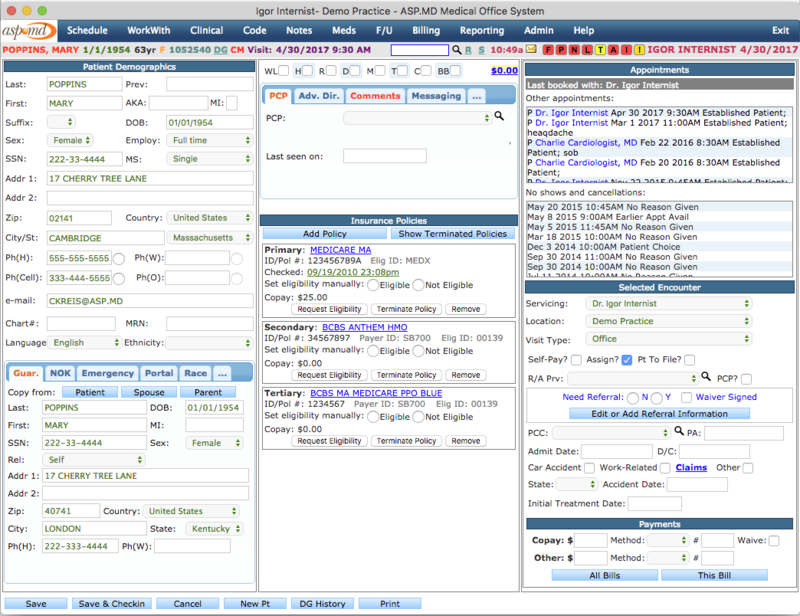 Additionally, our billing experience drives our software; we update it constantly to deal with the latest challenges. And every new feature we add, goes out to you the very same day. With web based software, there’s no waiting for the next version. Do you really want to pay for billing software made by a company that doesn’t do billing? And, do you really want to use a billing company which doesn’t make, understand, or control the software they use? At ASP.MD we’re tech experts, medical experts, quality experts, and billing experts – a rare combination, but exactly the combination you need. With our proprietary system with rules built right in, we’ll get you paid more, faster, with fewer denials and a much lower cost. And, we’ll go beyond software, with experienced staffers working your claims constantly. At ASP.MD we don’t just do the easy part- we do it all. For less than you’ll pay anywhere else. With ASP.MD billing services integrated with ASP.MD software services, you’ll get the smoothest, most efficient, least costly billing service available, with the best possible outcomes. 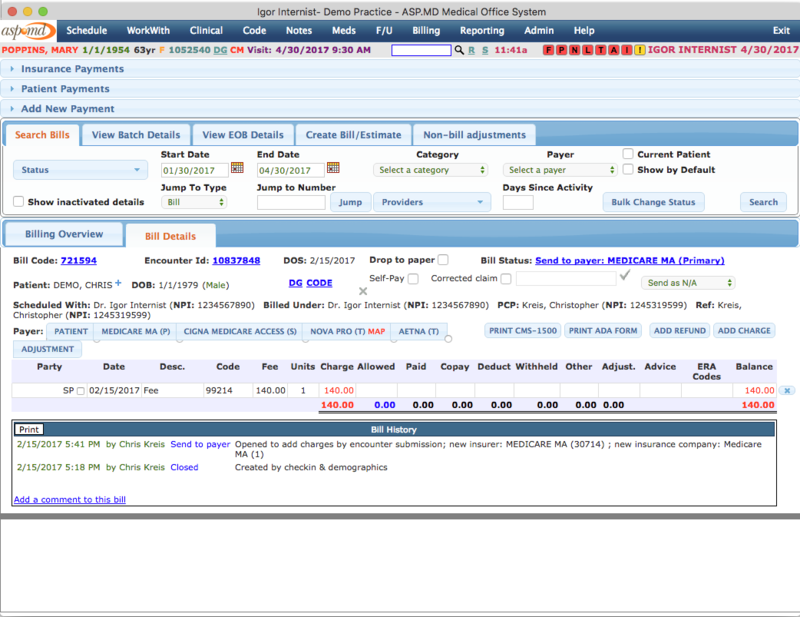 And, you’ll have complete, real time insight in to your billing process. No more wondering how you’re doing or whether your billing company is really working your claims or letting tough ones ride inappropriately. No more finding out months after the fact that they’re doing a less than optimal job, leaving money on the table that should be in your pocket. With ASP.MD’s fully streamlined and integrated scheduling, registration, practice management and billing, your front desk will immediately know any patient balances in real time. So, when they’re checking in a patient, they raise the issue of any unpaid balances immediately. It’s the most effective way to collect, and, it will make a difference. ASP.MD’s billing and follow up process is streamlined and works like a machine to get your problem claims worked and paid. Compared to in house billing, you’ll never have to worry about employees on leave or vacation. Our scale is such that we always have enough redundancy to keep your account totally up to date. With an average 28 days in A/R, a 95% first pass payment rate, and, collections of up to 98% or even more of allowables, you can rest assured that every penny that can be collected is being collected. Want to keep your existing IT systems but still save 40-50% on your billing costs, with better, faster collections? We can do that too. ASP.MD can plug in to your current infrastructure at any level, and still provide substantive savings over your current process. Still prefer dictating over typing or checklists? Give our transcription services a try. We’ll typically shave 30-40% off your costs, with near perfect accuracy and overnight turnaround. Want to avoid the computer interaction as much as possible but need to capture structured data for quality reporting? Use our structured dictation service to extract the data you need (then use ASP.MD’s quality reporting features to report). At ASP.MD, we make medical documentation smooth and painless. Do you ever wonder if the Federal Government has entire departments organized just to dream up new and trickier programs for you to adhere to, and, to constantly change existing ones so that you can’t possibly keep up? And other departments to post reams of arcane, conflicting, and out of date documentation on any of several federal websites about these programs? It certainly seems that way, doesn’t it? The regulatory environment for today’s medical practices is overwhelming. Just when you think things have settled down, congress releases another 2,000 pages of healthcare legislation, including lengthy updates to all of the healthcare IT programs. It’s simply too much. Unless, of course, you’re with ASP.MD. 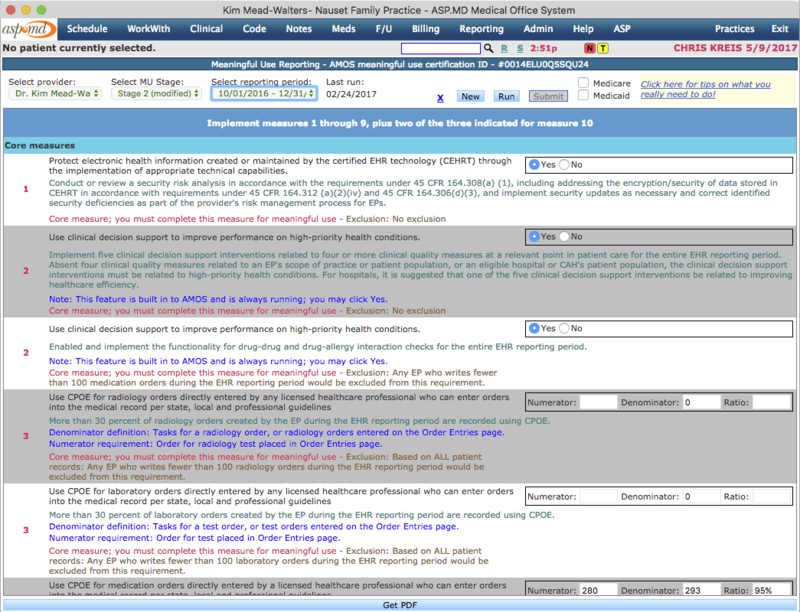 ASP.MD simplifies the regulatory burden. We make data gathering and reporting seamless and easy. Our distributed documentation keeps on you top of the reporting requirements. Our system tracks your data and presents it in useful dashboards so that you can see how you’re doing. ASP.MD even monitors your progress, to see how you’re doing. And finally, if you need to, you can call and actually talk to an expert. Someone who knows what they’re doing, and can tell you what to do. Have you been forced into manual registry reporting? 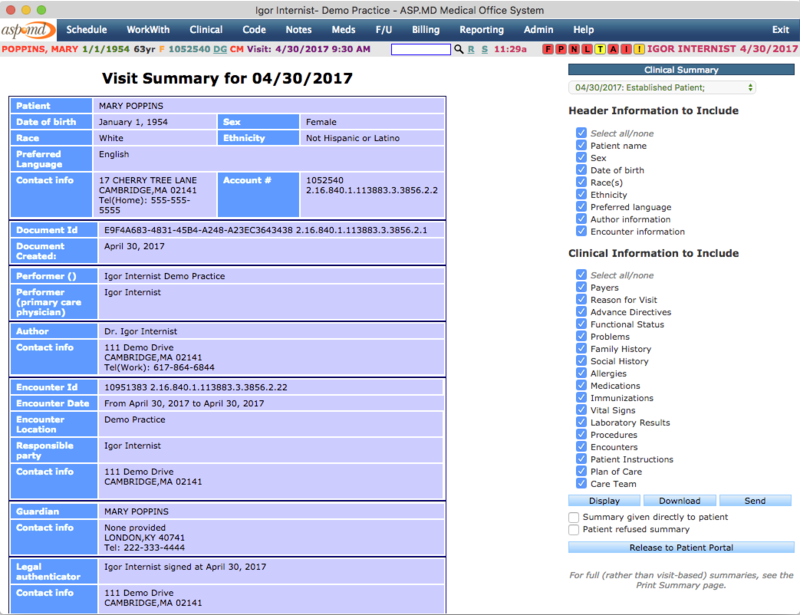 Combing your EHR for data, manually extracting it, and then plugging it in to another website!? 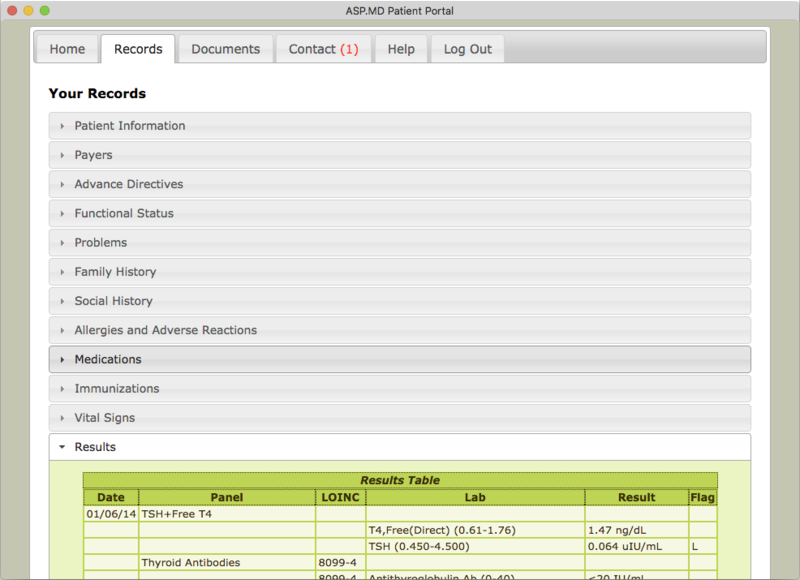 What’s the point of having an electronic health record, when you have to manually extract data? Or, are you locked in to claims based reporting, where you have one chance to get it right, and you can’t go back. Consider the ASP.MD alternative; see your patient, document your visit, and let us take care of the rest. We’re one of only 17 vendors in the country which is both a CMS “data submission vendor” AND a CMS certified “Registry”. 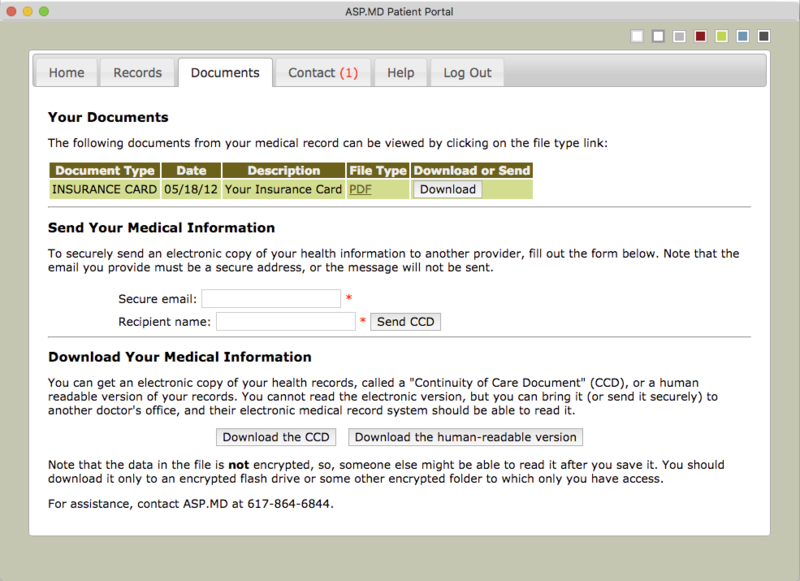 And unlike other registries, there’s no manual data entry with ASP.MD. ASP.MD has gotten every one of our providers through meaningful use and PQRS. Give us a call to see how much easier we can make MACRA and MIPS for you. Take a dive into our software solutions in action through the screenshot galleries below. Look up a patient. Choose an appointment type. Click a time slot. You're done booking. Drag and drop to change an appointment. Update or alter the visit comment. Automatic eligibility status indicator. Automatic reminder system. Arrival Indicator. Checkin/checkout/no show indicators. Appointment status flag (Room 1, Room 2, Billing, etc). Any number of schedules. Schedule people, rooms, equipment, etc. 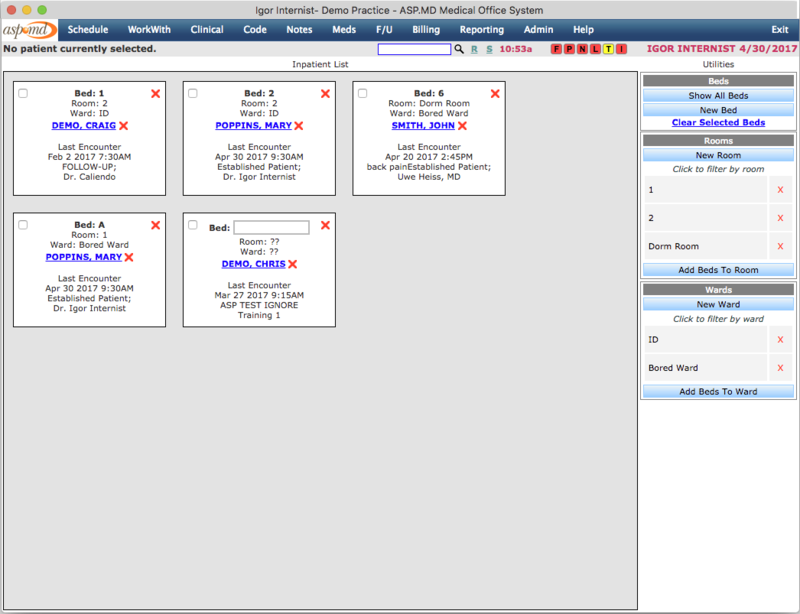 View multiple schedules. Find a scheduled appointment. 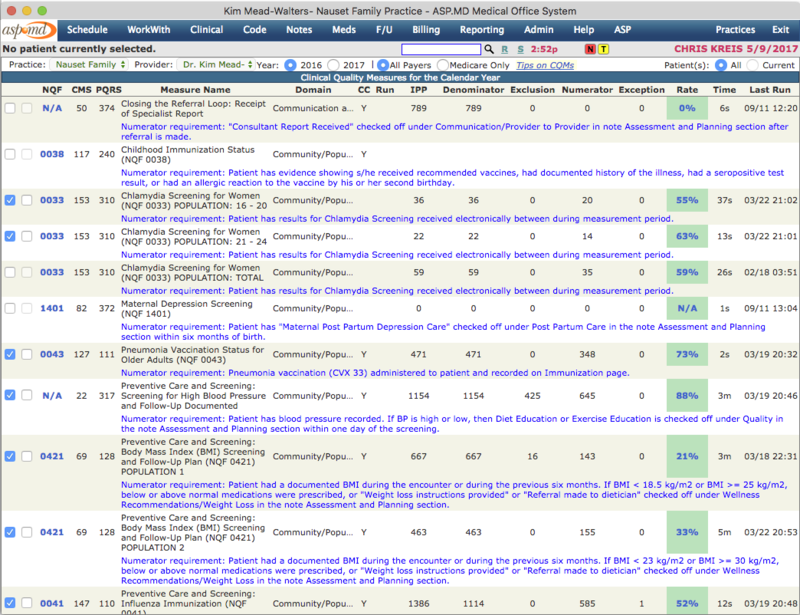 See recently accessed patients. See today's schedule from any page. Customize your days; set a start and end time, and then use colors to block out your schedule. Copy blocks from one date range to another. Everything you need (patient, guarantor, insurance, referral information, etc), all in one place. Systems ensures that all basic information is entered, with an option to require PCP or referring entered as necessary. Referral tracking. One click electronic eligibility checking from within the demographics. Pop up alerts and comments. 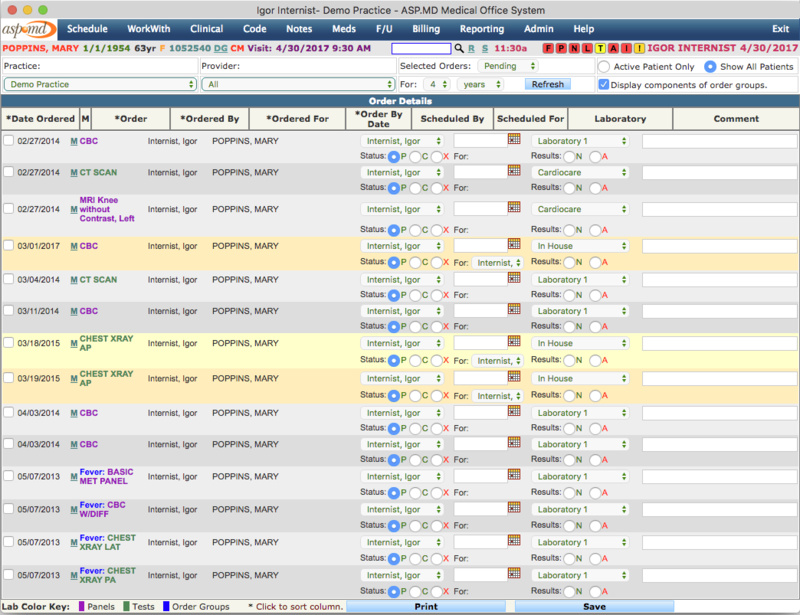 Real time patient balance displayed any time you access the patient. 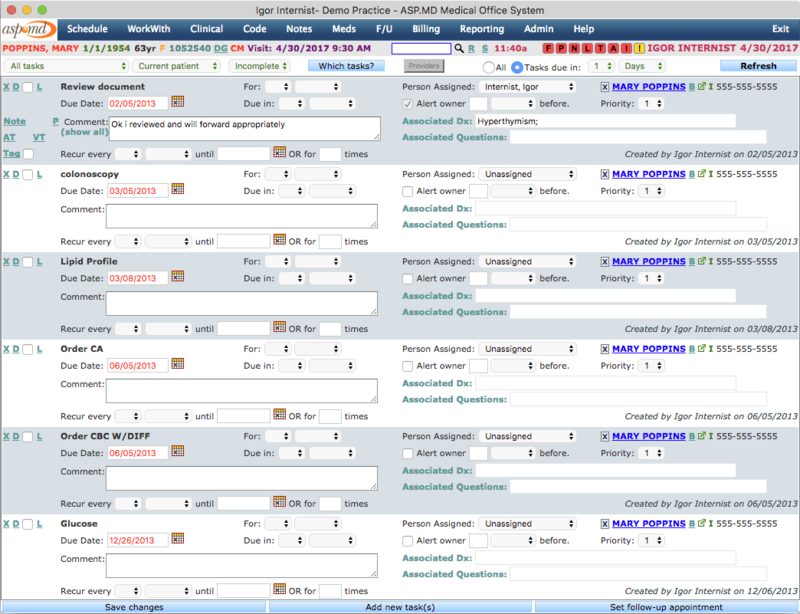 If a patient has been entered two or more times, easily merge both the patients and all their associated information. Accidentally merge patients? Easily unmerge them. AMOS keeps everything in this otherwise tedious process straight. Fully customize visit types and duration, and, assign a visit category as well for easy templating. Set up custom statuses for display on schedule. One stop access to all of a patients core clinical information. Problems, meds, allergies, past appointments, labs, and all notes and documents. Refamiliarize yourself with your patient in a glance, before you go see them. When you select a patient, AMOS also tells you which quality measures you are following for that patient, and, what you need to document to meet the measure. A more detailed view of the problem list. 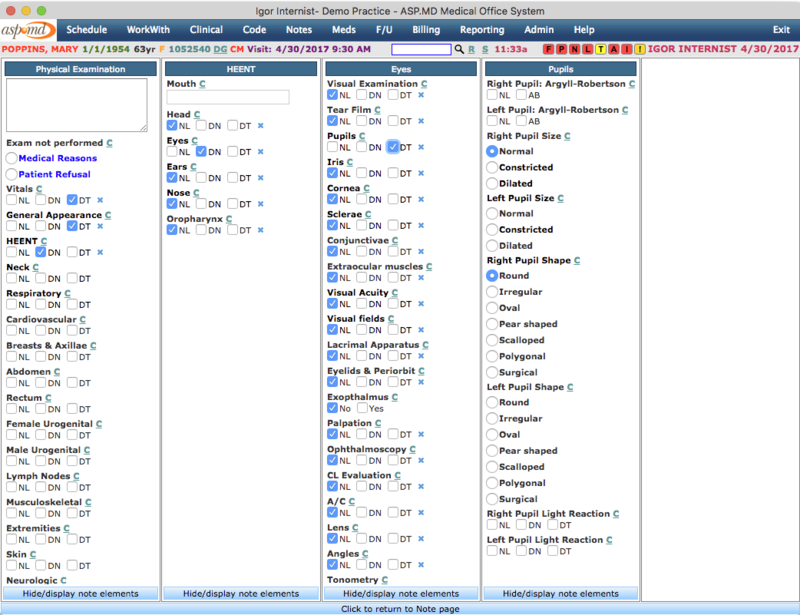 Add, remove, reorder problems using ICD-10 or SNOMED coding. Add a comment to a problem. 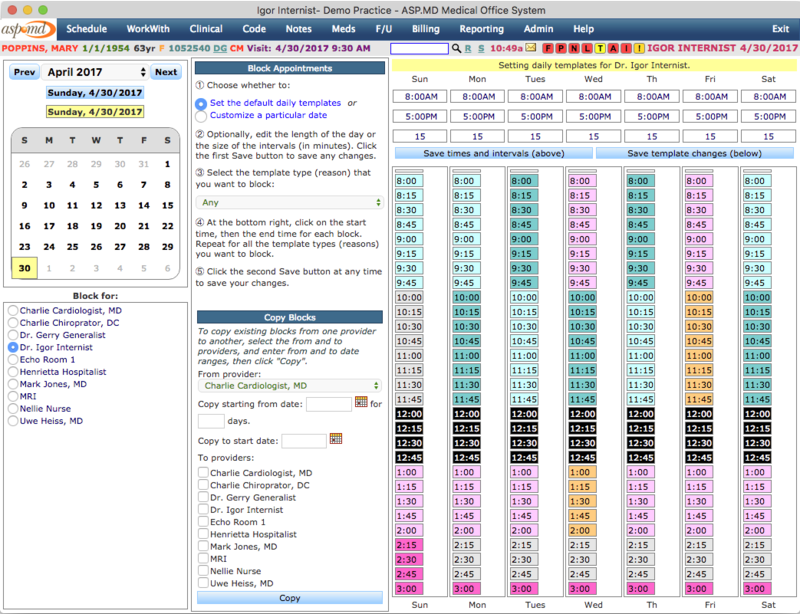 View vitals, height, weight, etc, over time. 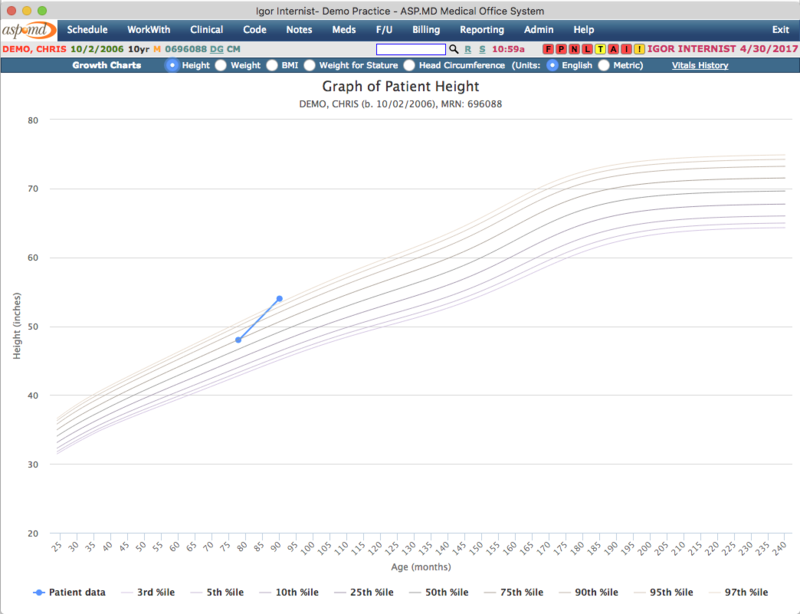 Graph pediatric patient height, weight, head circumference and BMI. Print, fax, or electronically transmit (secure direct email) a complete clinical summary for your patients. 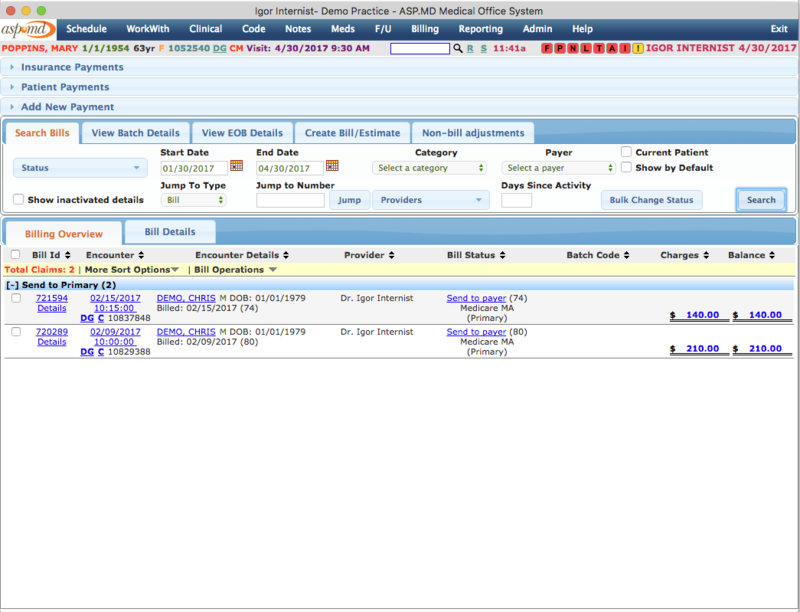 Electronic prescribing; on the meds page, you'll see the patient's current allergies and meds, and can add, remove, or prescribe. 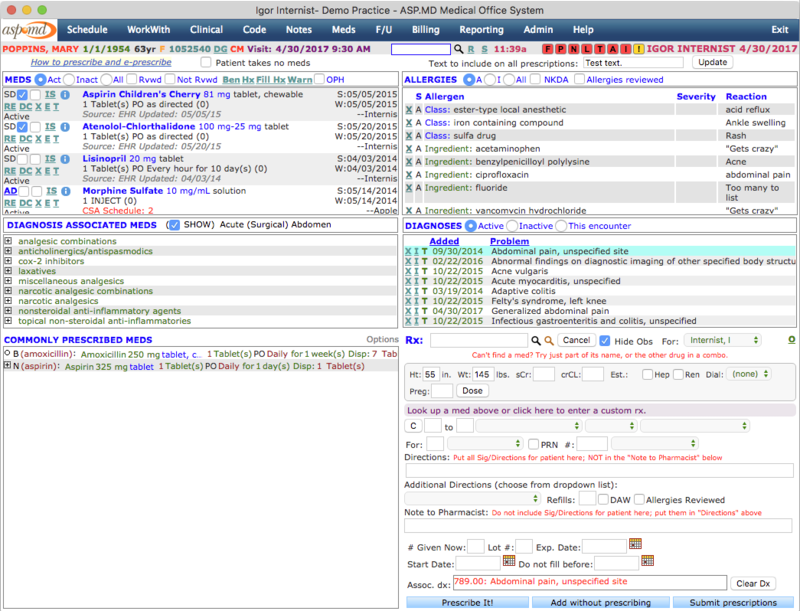 Drug-drug, drug-disease, and drug-allergy checks are performed automatically. 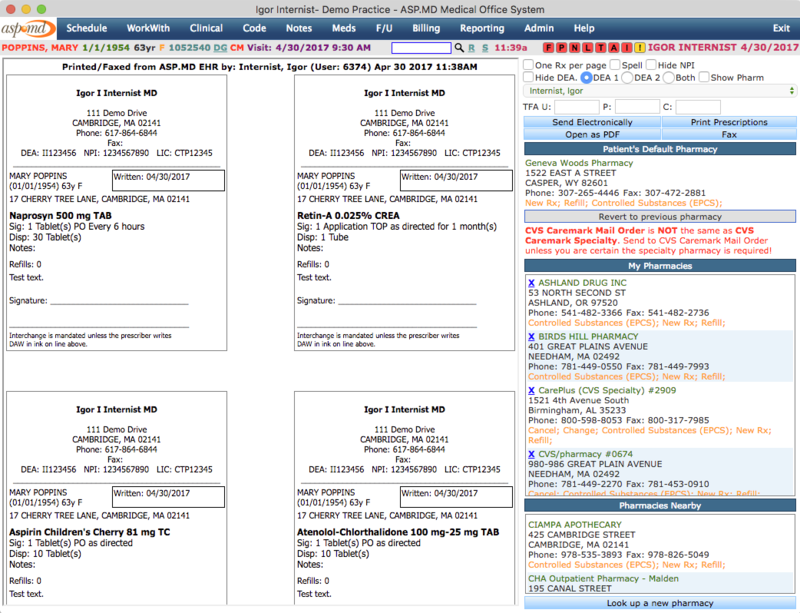 Electronically check a patient's complete prescribing history across the entire nation. Check a patients benefits and view specific formulary information. See the entire history of any medication; all the times it's been prescribed, discontinued, or sent to the pharmacy. Electronically and securely prescribe controlled substances. Reconcile an outside medication list with your own. After you've prescribed any meds you're going to, send them straight to the pharmacy electronically with a single click. What could be faster, easier, or more secure? Automatically receive lab results from practically any laboratory in America. No more faxes. 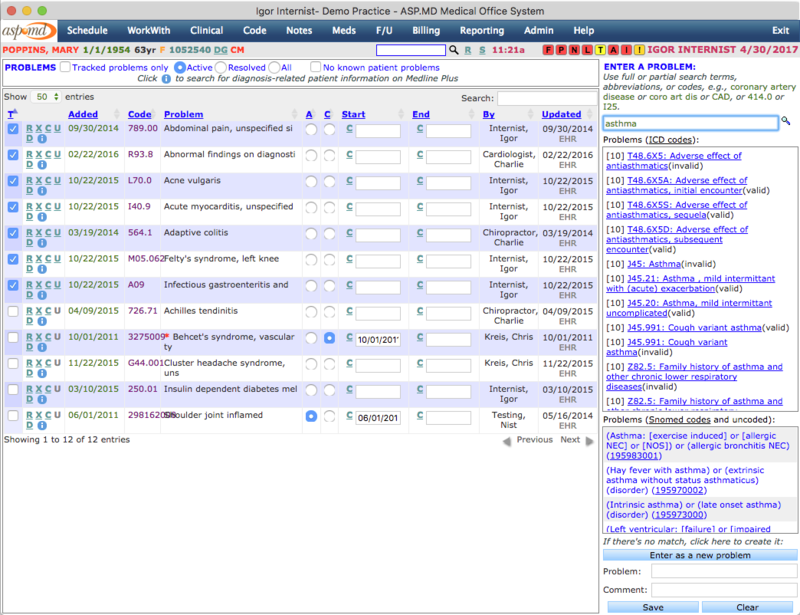 Search for specific labs over time like you can't do with pdfs, faxes, or scanned results. Easily choose any number of lab results, and produce beautiful charts of them over time. Write simple or complex notes using simple templates or extraordinarily detailed checklists. Recorded data can be used for quality reporting and other purposes. Use our templates, or, create your own. Comprehensive checklists let you quickly document just about anything with a high level of detail necessary for reporting and billing. Create fully customized checklists for your own use. Easily order lab tests, procedures, or anything else. Customize your own quick pick lists. Ask at order entry questions, alerts, and decision support. Orders can be instantly sent electronically to any lab in America. The system tracks orders until the results come back, letting you know if tests are never performed. 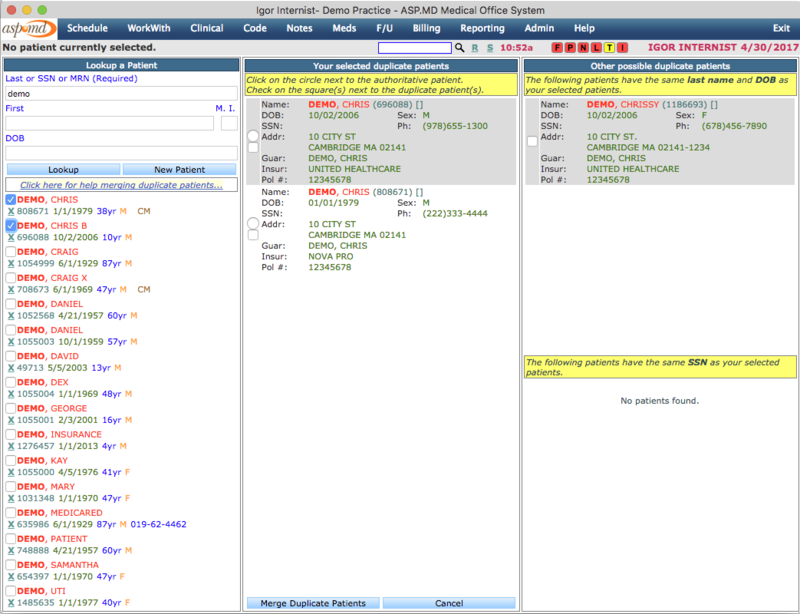 Keep track of all your inpatients, and exactly where they are. 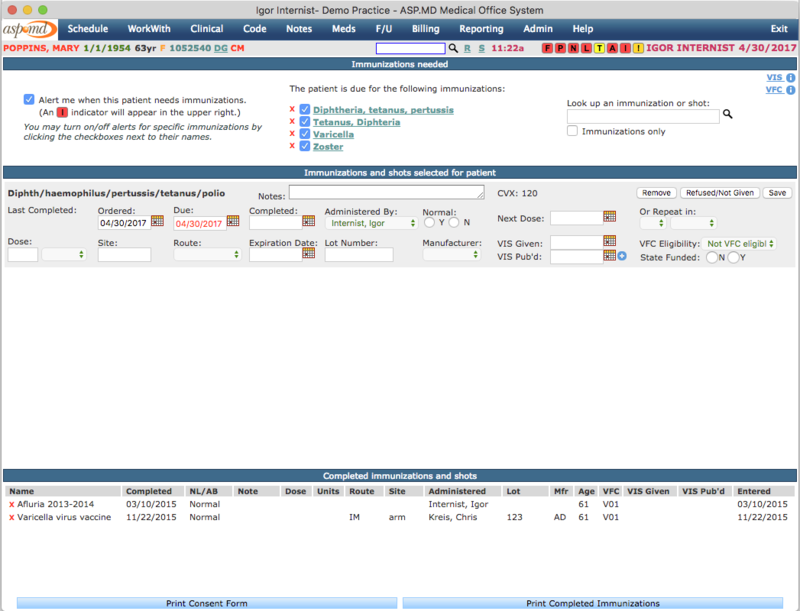 Track immunizations electronically, and AMOS will automatically send them to your state registry. Set tasks that you need to perform. The system will automatically alert you when they are due. Scan or upload any document or image; or, take a picture with the AMOS mobile app and it goes directly in to the chart. Direct your faxes in to the system electronically and totally eliminate paper. 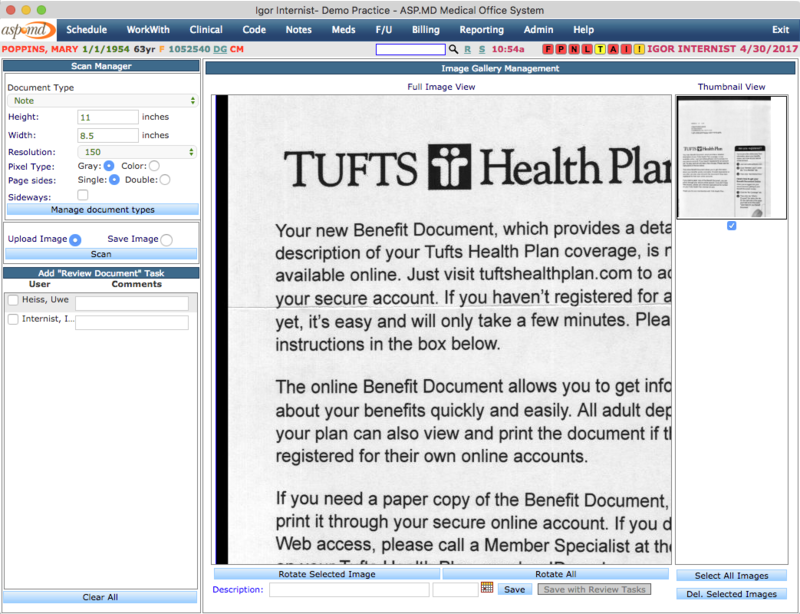 Merge documents in to new ones, and send them out to other practices via direct email or fax. Code your visits electronically. AMOS helps you as you code, telling you if certain procedure/diagnosis combinations are required or invalid or require a modifier for a given payer. Tracks all your visits and coding to make sure that you didn't miss coding one. Once you've done your coding, AMOS automatically generates your claims. See all your claims queued up to go out to their payers. Send them electronically to payers with a single click. 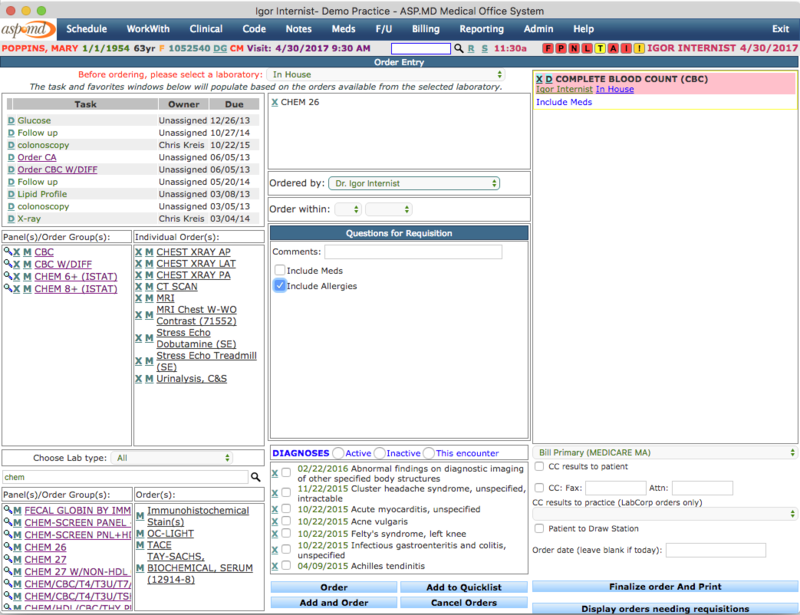 AMOS can generate professional, institutional, and even dental claims. Once you've sent your claims, of course you'll want to track them. Track every outstanding bill on this page, searching and sorting by bill status. See which bills are in what status, and how long they've been there. See the complete details on any given claim. Where is it now, where has it been, what's been done and by whom, and what's to do. Details are automatically, electronically applied to bills the moment they come back from clearinghouses or payers. Add your own comments as necessary, or, automatically electronically check a claim status. Receivables, Charges, Collections, Productivity, and dozens more. Don't want to use electronic coding? Full support for paper encounter forms is still available. Process credit card payments directly through the system. Eliminate your point of service device fee, and, have payments go directly on to the patients account. 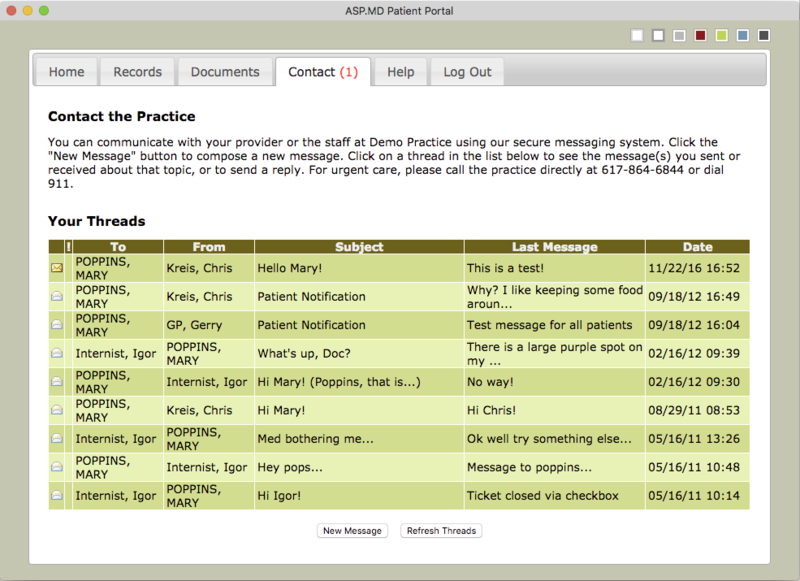 Send messages to other users of the system, or, to a patient. Each message thread is individually tracked, and message threads can be closed when they are complete. 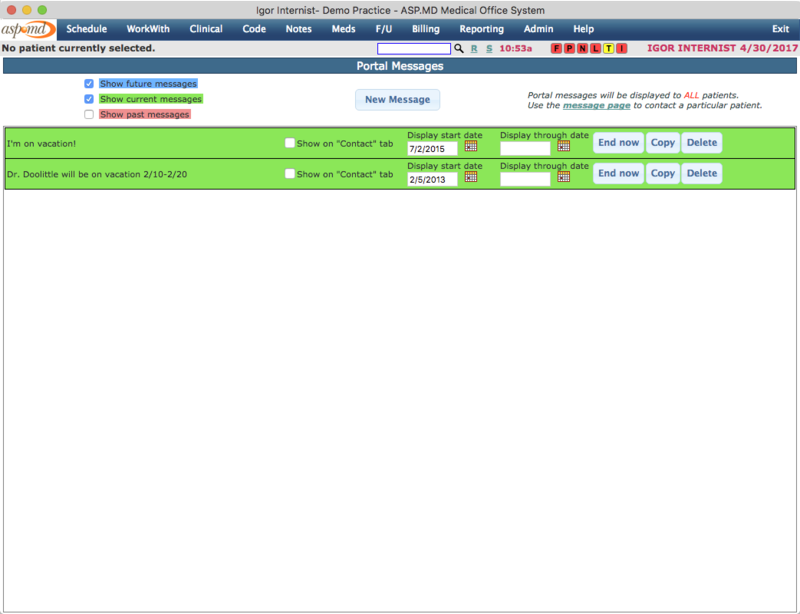 Your patients can also securely message you via the patient portal. Broadcast a general message to all of your patients on the portal. All the standard billing reports you expect (charges/payments, A/R, etc), and, dozens of other reports as well. One stop reporting for Meaningful Use / MACRA / MIPS. Clearly see what you've done and what you need to do. 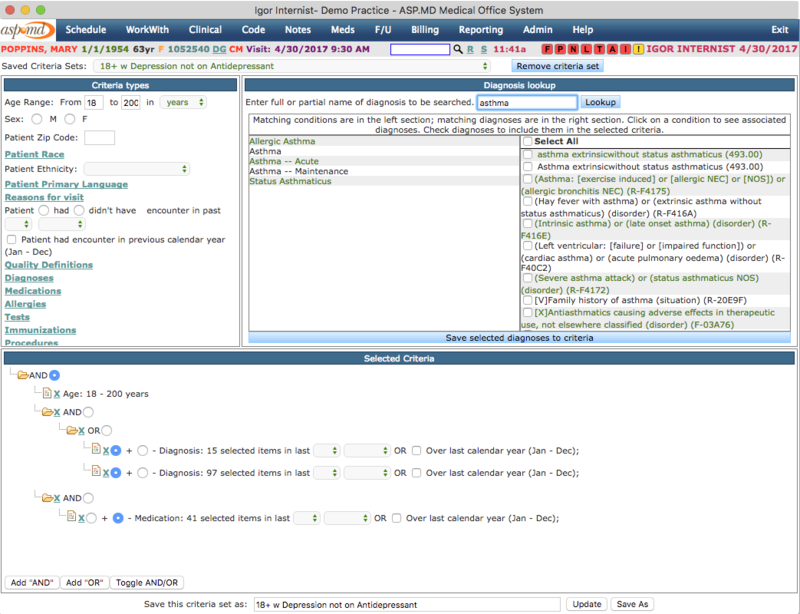 Complex automatic quality reporting based on electronic quality measure definitions. 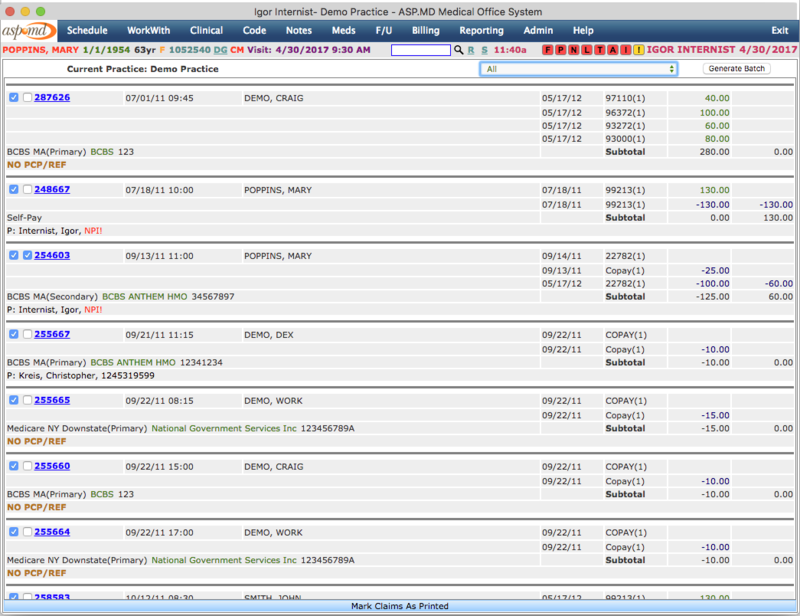 Fully automated reporting taken care of by ASP.MD for you. 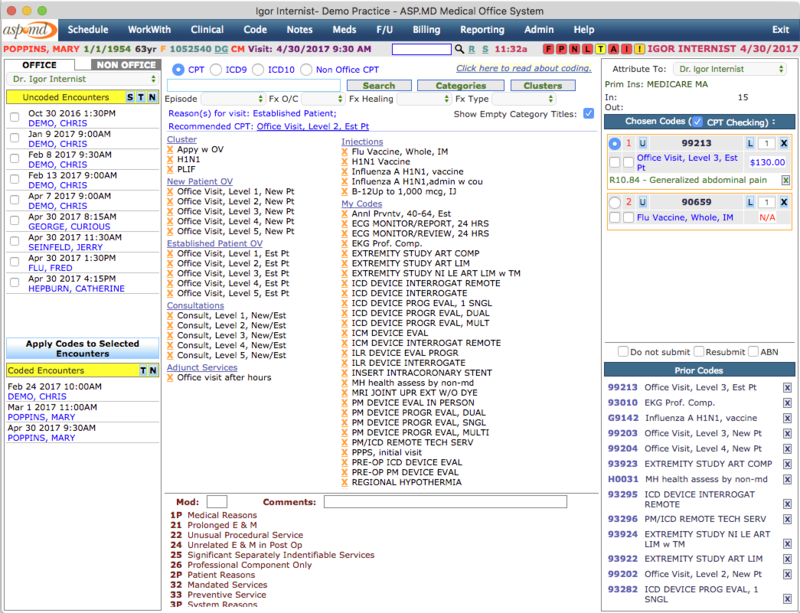 Allows you to generate complex ad hoc report from practically any data in the system. Patients log in and see any relevant notifications about you, your practice, or inbound messages or results. From here they can navigate to other tabs. 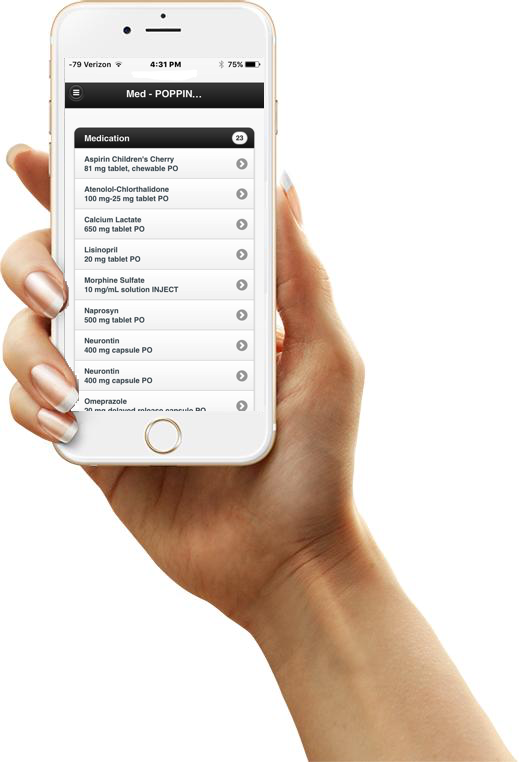 Your patients can view their clinical information, including lab results, problems, meds, allergies, and more, right in the patient portal. Share notes, documents, visit summaries with your patients on the portal. Patients can download these documents or send them to other providers by secure direct messaging. 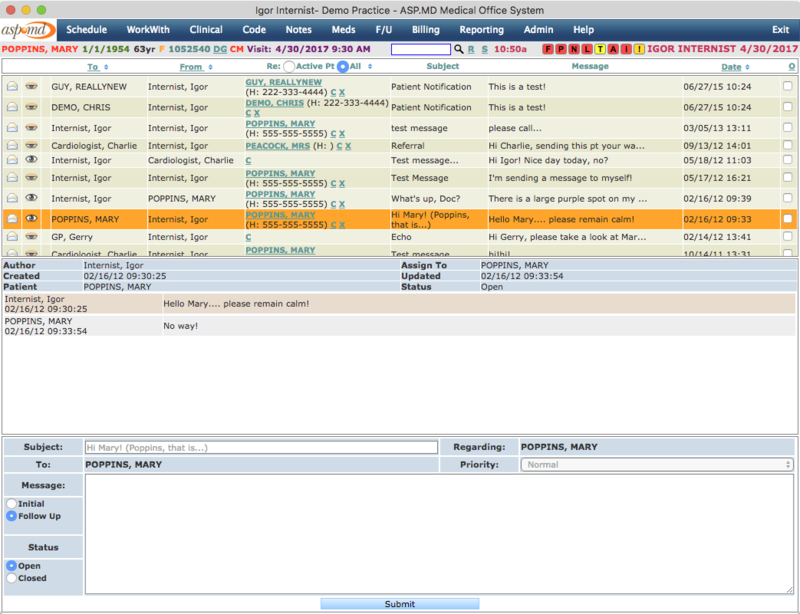 Exchange secure messages with your patients on the patient portal. 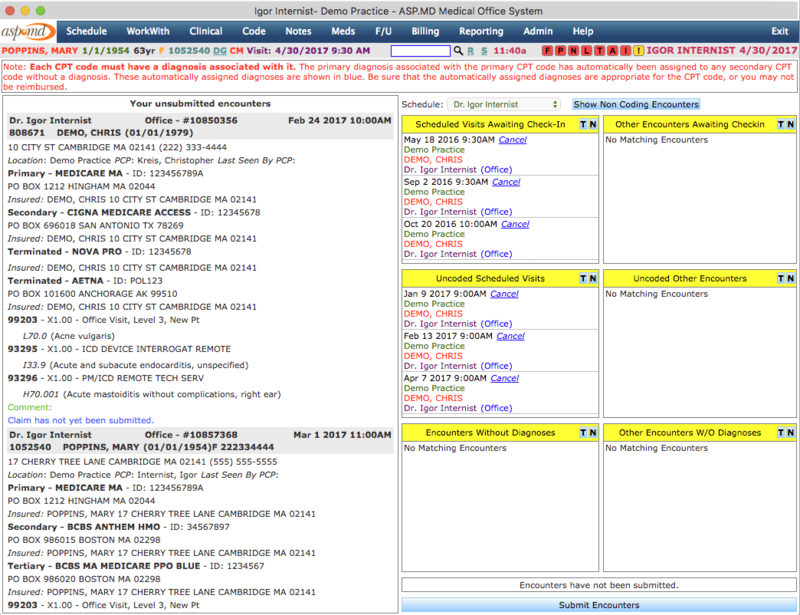 The ASPMD solution is optimized for your desktop, phone, or tablet. Anytime you need access. Anywhere you need access. Contact us now and learn how we can help revolutionize your health care practice!